We always think that those who have natural straight hair are lucky because they don’t require high maintenance and their strands are frizz-free. Well, that’s what most people who are born with straight hair believe, too. The sad truth is, straight hair is also prone to becoming dry, dull, dirty, oily and totally unmanageable. And even if you are born with naturally straight hair, it doesn’t mean it will stay the same forever. The thing is, every type of hair needs care and maintenance. Thus, if you want to keep yours looking great at all times., you should know how to take good care of it. Now, are you having second thoughts about the hair care products you are currently using? Are those products really meant to be for your straight hair? Well, if you haven’t made up your mind yet, and you want to find the best product, here are 9 of the best Osensia hair care and styling products that you might want to check out. You never know, these might be the products that you have been looking for. you experiencing hair loss these days? Do you have a thin hair that looks weak and dull? Using Osensia’s O so Thick & Strong Shampoo is the solution to your problem. This product is infused with high performance biotin that smoothens and strengthens weak hair. It also adds thickness in each strand for a volumized look. It keeps your hair away from breakage and promotes hair growth, too. Further, this product contains Aloe Vera, Pro Vitamin B5 and cucumber extract, which gives your hair a calming and soothing look, and adds shine and moisture. More importantly, it’s Paraben and Sulfate free. To use, simply apply the right amount of shampoo on damp hair and rinse thoroughly. 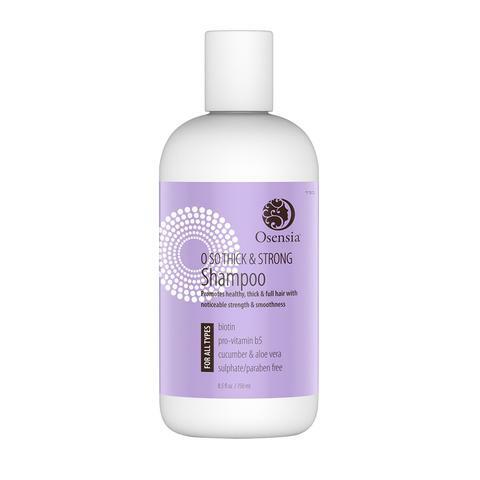 O so Thick & Strong Shampoo is also great to use for those who have thin and dry hair. Use it regularly so your healthy hair will stay in place. For best-looking healthy hair, pair it with O so Thick & Strong Conditioner. You will be happy with how this conditioning product would make a difference to your straight hair. 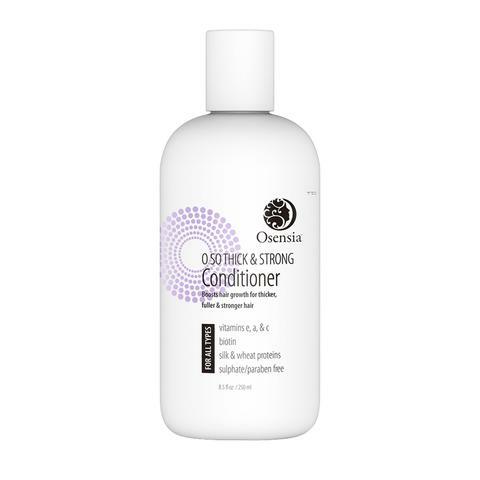 If you want more moisture and volume, leave it to the O so Thick & Strong Conditioner! This product is infused with biotin, pro Vitamin B5, silk and wheat proteins. It is also sulfate and paraben free. Silk proteins create a protective barrier and enhance the elasticity of the hair, protecting it against breakage. Wheat proteins, on the other hand, help boost volume and condition and moisturizes hair. To use, apply a small amount of this product, starting from the mid lengths to the ends of hair. Then, gently lather and massage it in small circles using your finger pads for 2-3 minutes. Next, rinse well using cold water to make sure hair cuticles are tight and moisture is locked. 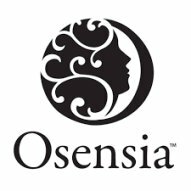 By using this Osensia product, you can achieve your dream healthy straight hair without having to use any harsh chemicals or ingredients. Although some of us may opt to skip applying shampoo for two to three days, washing hair regularly will actually make sure hair won’t look super oily and locks limp. You can use dry shampoo between washes to keep your hair look fresh and non-greasy. Since the introduction of dry shampoo, it has become a choice for many women since it brings back the life of dull locks and prevents hair breakage. 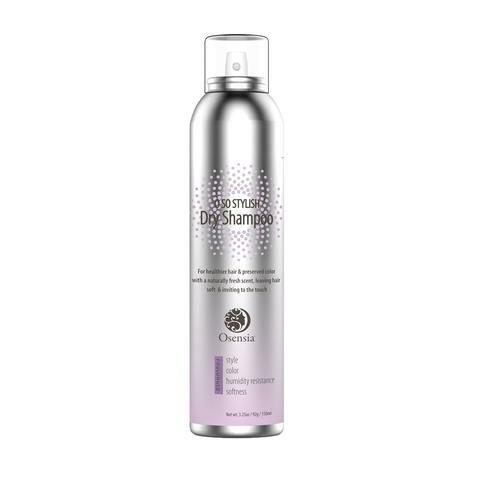 Osensia’s O so Stylish Dry Shampoo is the right product to use as it instantly cleanses the scalp and hair, without leaving a chalky residue or dulling effect. Always remember when using dry shampoo, it is advised to apply it all throughout your hair to save your style and to have a refreshing look. Some of us opt to leave the conditioner on our hair until the next washing in order to produce more moisture and keep the locks shiny and smooth. But do you think you are using the right conditioner? If you want to keep your straight hair healthy and away from any harmful chemicals, better use O so thick & Strong leave - In Cream. It is infused with biotin, coconut oil and botanical extracts, which encourage hair growth and prevent hair breakage. Most of the ingredients of natural hair care products include coconut oil as it can do anything, such as helping boost the hair follicles and promoting hair growth. It also consists of essential nutrients that your hair needs to keep it healthy and shiny. This cream is best used for restoring damaged hair, dry, and frizzy hair. Thanks to its botanical extracts, your colored locks are also protected from fading. If you love styling your hair, you can also use this product to create a heat shield and protect your hair from the environment and any harsh color treatments. Hair mousse is mostly used to create hairstyles and give more bounce to curly hair. But did you know that it is also great for straight hair? Now, you may be wondering, “What can a hair mousse do to straight hair?” Well, it would be difficult to style straight hair as it won’t become wavy as quickly as possible without using a hair mousse. Also, with a hair mousse, you can condition hair, add extra volume, and hold hair in place. Hence, when it comes to transforming your straight hair, O so Wow Foaming Mousse is your friend. Infused with Ivy and root extracts, rice protein and burdock root, this product can help strengthen hair fibers, hydrates your strands, and remove the excess oils and flakiness on the scalp. To use, spray an ample amount to your damp hair. It should result in a hair full of volume. You can also use it directly on dry hair to prolong hold. But for better results, blow-dry it. Get impressed with O so Wow Foaming Mousse and set your ideal hairstyle now. 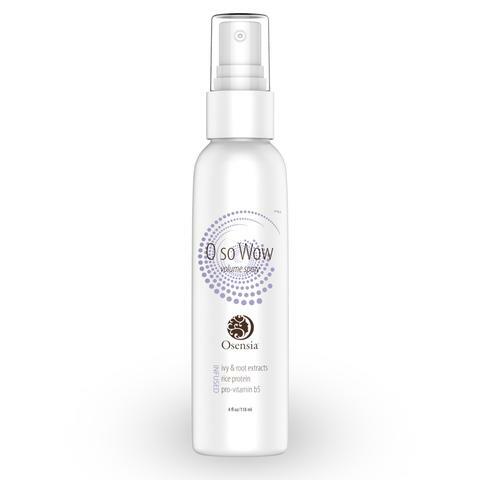 Another product from Osensia that provides color and heat and styling protection is O so Wow Volume Spray. It nourishes your hair while protecting it against hair loss and thinning. It also gives an incredible long-lasting volume. This product is infused with Pro Vitamin B5, Ivy and root extracts, and rice protein, which all work to texturize, strengthen, and protect your frangible hair fiber. To use, spray it on damp hair and leave it until the next washing. Comb your hair in a gentle way and style it for extra volume. Are you always exposed to the sun? Does your hair look dull and weak? It’s time for hair repairing then! Make time to exert extra effort on your hair and nurture it the same way you do to your skin. It is not just enough to apply shampoo and conditioner. Give your hair the treatment it deserves at least once a week to maintain the healthy locks. Osensia’s O so Nurtured Argan Oil will bring your hair back to life and help make it look lovely again. This product has Argan oil hair serum that makes your hair better and protects it from daily elements. You will reap more benefits from using O so Nurtured Argan Oil. Aside from hydration, hair repair, and protection against sun damage, this product adds shine and glow to your tresses, since it is infused with Vitamin E and antioxidants. To use, simply massage Argan oil hair treatment from roots to tips to damp hair. If you want to get amazing results, always go for natural formulas like this! Are you preparing for a last-minute party? If you want to transform your hair from straight to wavy, use O so Playful Sea Spray and play with it. This product provides gentle hold to your hair and gives you that beach fresh feeling with its scent. It is infused with natural sea salt and kelp extract to nourish your hair and adds extra volume. To use, simply spray to your dry hair and scrunch it to get the natural wind-swept freedom. What are you waiting for? Effortlessly achieve the beachy wave look in no time with this spray! 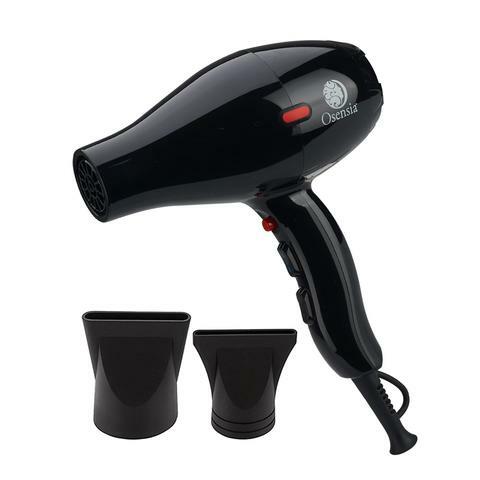 There are many hair dryers to choose from nowadays, and it’s hard to find the right one that will take good care of your straight hair. If you really want to achieve healthy straight hair and maintain it, you need to invest on high-end hair dryers, which are the ones commonly made with ceramic or tourmaline materials. With Osensia Prodryer-X, you’ll achieve salon-quality results at home, thanks to its hair-protecting technology. This type of hair dryer cuts drying time in half, releases negative ions in order to reduce static, boosts moisture, and protects each strand. The result? Hair that is naturally shiny and sleek. Finding the right hair care products is like a love-hate relationship. You choose a product that you like, but it doesn’t treat your hair the way you want it to be. Yes, it takes a lot of time to determine which products perfectly matches your hair needs, but once you become an expert from using the right hair care products, your hair will soon thank you. Starting today, make it a habit to keep your naturally straight hair healthy and lovely with these products.